As I returned from my self-enforced sabbatical (the kind that all good cartoonists go on occasionally to wind up their editors) and trudged through the accompanying virus that I seemed to pick up as a finale I wondered what kind of product I should review upon my return. Should it be one of the fabulous exotic gifts that I've been given over the past few weeks? Should it be one of the many new regular products I've picked up and integrated into my eating habits over the past month or so? Or should it just be a regular review of something that I just happened to eat on the right day? 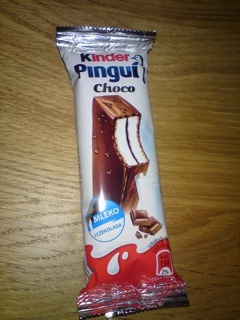 I decided to plump for the latter and grabbed the Kinder Pingui off the top shelf of the fridge where it's been patiently awaiting its demise for the past few weeks. After eating the Kinder Milk Slice on a stupidly hot day in Spain and then finding out that you can actually get them here (just not as plentifully) I decided to track down similar snacks. My usual Polish Grocery store (that I'll have to take a picture of or at least write the name down of one day) had a bunch of these in their fridge hiding next to the sausages I dare not try. The Pingui itself was much lighter and fluffier than expected. I'm not sure whether the cream inside required refrigeration, but it certainly benefited from it. Essentially it’s a white chocolate creme sandwich covered in a very thin layer of Kinder chocolate. It tastes quite delicate and isn't over sweet. My stomach looked for the second one straight afterwards, but alas these are solo affairs. This range of snacks are much less heavy than typical Kinder things which tend to be solid chocolate with the occasional toy thrown in to add vitamins. If you like an odd mix of cream & white chocolate in your cake bars then seek these out. They taste differently to most of the UK ranges so may be what you are looking for. Ooh this looks interesting, looks nice and creamy!